This month's Games For Windows magazine plugs a little (Japanese?) 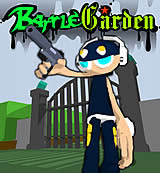 Flash game called Battle Garden. It's a shooter on rails, and extremely fun and fast for a Flash game. There's not much variety, as the game simply loops the same dozen or so scenarios over and over, but the gun mechanics make it worth it. Nerdy and noteworthy are the sound effects -- you will recognize some gun sounds lifted directly from the N64 classic, Perfect Dark. Oh, and the headshots are fantastic...your opponents literally explode! The game is on many different "free game" sites, but GFW posted this link. Try it!